KHHI unleashes one of its greatest constructions comprising various features to accomplish many different objectives in/by the same multi purposed survival knife..thus truly making it THE ONE to carry at ALL TIMES. An exclusive and excellent creation of multiple functionality crafted for all survivalists and naturalists to endure and overcome the brutality and hardship a mammal or terrain can inflect upon. 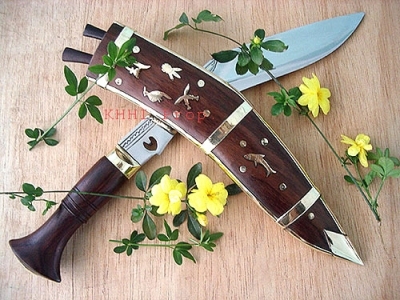 KHHI unleashes one of its greatest constructions comprising various features to accomplish many different objectives in/by the same multi purposed survival knife. This 7” MultiCraft’s in-built diverse executives, with accordance to its name, serve it master with a variety of tasks (usefulness) and thus truly making it THE ONE to carry at ALL TIMES. Blade: This is the strength and stronghold of the MultiCraft’s sheer power, purpose and variation. This is where a single simple looking blade reveals its true color of what it can really do and deliver. The maker here has manipulated the shape, size and edges in such a way that all basic and tactical objectives are met within or by a single blade. Front portion’s (lower shoulder) shape is bulged out extensively to accomplish easy, effortless and effective swing (blow). The length of the curve is full 5 inch and thus has enough coverage against a target. Spine/edge of the lower shoulder is forged completely flat and left rough and widen a bit in order to use it as a hammer - to pound things if and when needed. This area of the blade is equally well tempered to stand beating and thumping. Spine/edge of the upper shoulder has a serrated back, having multiple sharp cuts to work relatively like to a saw for various tactical, utility and constructive purpose. Back portion (bevel) of the blade is forged straight to be used as a knife to slice and slit. It covers a full 2 inches which provide a good space/length to meet the objective. The overall length of the blade is only 7 inches which make the knife very practical and easy to use and mobile at the same time. Large elongated very sharp and steep bevel (patti) is forged to inflict deeper and greater impact with very less effort. Blade is made unpolished to keep good temper and solid cutting ability. A see through “HOLE” is also made in the blade near the guard which comes as a part of its unique style and to distinguish it from the herd. It may come handy for other reasons too that involve cutting and splitting. Multicraft blade is a small yet bulky hacker to whack things out deep in the jungle and hence the name "Jungleman". Scabbard: Sheath of MultiCraft is another important segment that makes it effective, functional and thus very special. A special flexible leather is used for the scabbard to prevent the blade from getting scratches and to have a swifter, faster and easier draw (in and out) even when tucked in the belt. Moreover the scabbard frame is carved slightly bigger than the blade, giving more room inside in order to achieve very easy operation. A leather belt with fasten-up button is fitted in the back of throat of the scabbard to secure the khukuri firmly to the scabbard. Similarly a shoe lace as shown in the picture is fitted in the frog to tie the khukuri’s handle to prevent it from wobbling while the user is moving carrying the knife in his belt. The lace would give him easy carriage and better movement. A lanyard loop is also kept in the tip of the scabbard to ease carriage and thus motion - where the user can fit a string and tie the scabbard to his thigh. Size of Blade: 7 inches approx. Overall I am very very pleased with this Khukuri. It is nice to have something like this that came all the way from the top of the world with the little tool marks that you get from a handmade item. It feels strong and special and as a fabricator myself I know and appreciate the labor that has gone into its creation.